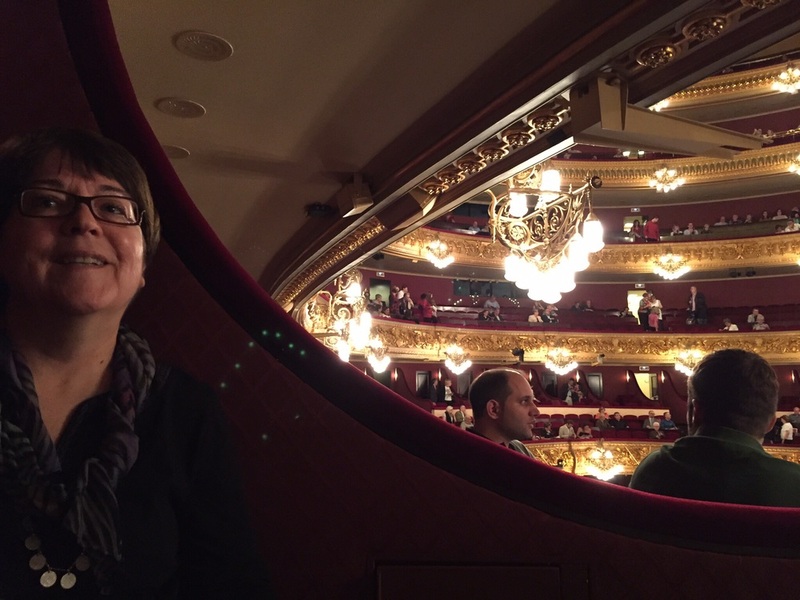 A night at the opera in Barcelona: The Liceu metro stop deposited us right in the middle of all the action on La Rambla, and the big opera house of the same name is right across the street. We rambled a bit before entering and found an interesting square and fountain in the nearby Gothic district whose street lamps seemed to be inspired by someone's gothic nightmare, although everything else about the square was in fine Mediterranean decor. Back to the Liceu. Cell phone selfies were the rule of the day inside the main reception hall and up the grand staircase. We had a box seat shared with another couple, native Barcelonans taking in their second opera, so recent converts apparently. Instead of a matron checking tickets at the box doors, we simply scanned our tickets to get in. I could see at least 2/3 of the stage, and the orchestra pit was right below, so I had no complaints. The opera house was beautifully opulent in design, and the place gradually filled to capacity leading up to the dimming of the house lights. A mix of old and young patrons, not too different from Des Moines Metro opera crowds. Opera dying? Not so here. The people seemed to be there to enjoy opera more than to see and be seen. We felt right at home. Lights dim, admonitions in Catalan and Spanish about muting phones, and the opening, keening strains Verdi's great romantic tragedy begin. Very impressive orchestra and principal cast. Carol said you could tell the lead soprano was doomed the moment she walked on stage, which she hastened to explain is actually a good sign, at least when the opera is La Traviata. By the closing curtain after the soprano had expired dramatically and convincingly, there were tears streaming down more than one face in our box.